“There is an airy grace and beauty about the castle at Himeji, which with its great height makes it a landmark for miles around. It was built in the fourteenth century by Akamatsu Sadanori. 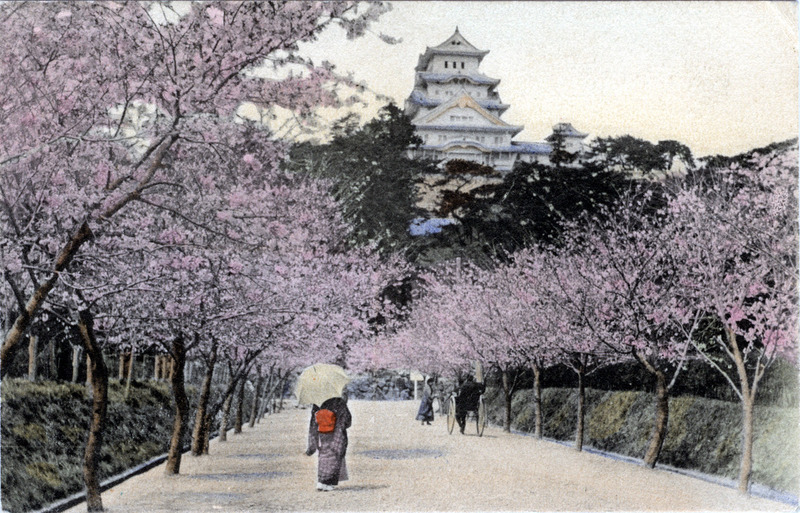 Himeji Castle, c. 1920, in Hyogo Prefecture. The castle is regarded as the finest surviving example of prototypical Japanese castle architecture. It is the largest and most visited castle in Japan. Himeji Castle was registered in 1993 as one of the first UNESCO World Heritage Sites in the country, and the area within the middle moat of the castle complex is a designated Special Historic Site and five structures of the castle are also designated National Treasures. “The site of the Himeji Castle, about 120 km west of Kyoto at a spot near roads leading to all of the western provinces and with the Seto Inland Sea to the south, was of great strategic importance [during the Tokugawa period] in keeping the provinces in the west under control. The nearby spacious Banshu Plains also make the castle a production and economic center. “… From the records we learn that a castle already occupied the location in 1333. In 1580, Toyotomi Hideyoshi, at that time one of Oda Nobunaga’s generals and the man responsible for the conquest of the western provinces, built a new castle here that was apparently complete with a three-story dungeon in the center, stone ramparts, and a number of attached buildings. “… In 1600, Ikeda Terumasa, the favorite son-in-law of Hideyoshi’s succesor for power, Tokugawa Kyeasu, became lord of this area … Though after the Ikedas, the masters of the castle changed three or four times and the castle itself underwent a number of repairs and innovations, the original form has been largely preserved.